Where do I start if I need a sign? Visit or call your local Zoning or Planning department. They’ll be able to tell you what type of sign you’re allowed to have, where you can put it on your property and how big it can be. Do I need a permit and if so, do you provide those services? 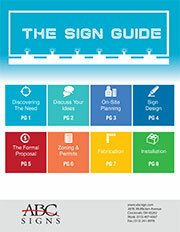 Most jurisdictions do require a permit to put up a new sign or make changes to the existing sign. Due to the various size and types of signs each job is quoted individually. Please call today and we’d be glad work up some numbers for you. Very Important: An effective sign doesn’t cost you money, it makes you money. What size sign can I put up? The size of the sign is usually regulated thru your local Zoning and Planning Department. What will it cost to have my sign serviced? Service calls are based on a time and material basis. We charge for travel to the location and time spent on sight plus materials. All trucks are fully stocked and ready to go. Most service work is called in with a NTE (Not To Exceed) dollar amount. This is a dollar limit which our service crews cannot exceed without approval. Do you repair lot lights and wall packs? Yes, our crews are trained and fully equipped to service lot lights and wall packs. We can help you track and manage your outdoor lighting. How often should I clean my sign? We recommend cleaning your sign at least once a year. The best time to do so is towards the end of summer about a month before the time changes. When you have your sign cleaned it’s a good idea to change all the lamps in the sign and visually check for other problems so when the holiday seasons come around your sign is clean and bright. Do you warrant your work? All new signs are warranted for one year parts and labor. All service labor is warranted for 90 days. All Materials are warranted for one year. How long will an outdoor sign typically last? How long something last depends a lot on how well it’s taken care of. A sign well taken care of should give you 8 – 15 years depending on the type of sign and the environment it’s in. Do you install and service signs? We have a full range of service and install equipment in house. Can you help us in the design a sign? We have a professional designer on staff to help with all your design needs. Do you take care of the other things beside the sign? Such as brick bases, landscaping and electric to the sign? These are services we can provide thru qualified subcontractors that we’ve worked with for years. Still have questions? Call us at (513) 407-4367 or email us today!